(for complete registration) Ornamental Design for a Pen or Pencil Case. Class 4. Proprietor. Mr William Vale, 181 Great King Street, Birmingham. 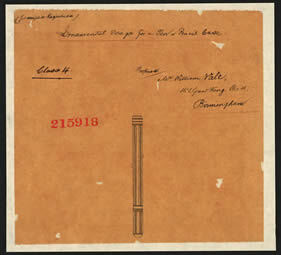 A design for what appears to be the metal casing of a propelling pen/pencil. This case could have been made of base metal or a precious metal such as gold or silver. If so, one would have expected this item to be registered under Class I - Metal. It is probable that the design was registered in the wrong class ledger.